It was a last minute thought on my part. Like most of our days, we didn't wake up with a plan. I certainly didn't expect an epic bake off. However, I was working on Friday and so it had occurred to me that without the non uniform day at school to mark the important fundraising effort everyone makes, Jenson would be oblivious to the whole event, and that wasn't on. Obviously, not having planned it I had no ingredients for said biscuits. In fact, the morning had been mostly about writing Simon's birthday card, which Jenson did with minimal effort. By 9am his writing lesson for the day was done and so we set off for the shops. Jenson had decided to wear shorts. He had stepped out of the front door an hour earlier and told me he had felt it warm enough. Come Summer or Winter, the sun was shining so in Jenson's books that meant it was warm. We made a quick detour via the 'digger shop', named as such when he was about two years old because it was the only place where he could buy proper vintage diggers. Sadly diggers are a thing of the past, as his purchase today shows. However, it wasn't that straight forward. I had refused to buy this £1.50 plastic 'snake man' for him on the grounds that it was horrible. I said if he wanted it we had to walk home for his wallet so he could buy it. We did. We had a quick maths lesson, during which he accepted that Wren was 50p short for some books that she wanted and so he agreed to lend her the money. All of this took a while and I anxiously glanced at my watch, conscious about how much time it would take to walk back to the shops, buy our ingredients, walk back home, eat lunch, bake the biscuits and get back out to sell them. I had acupuncture at 6pm, was going out at 7.45pm and the babysitter was booked for 7.30pm so a prompt bedtime for them was in the forefront of my mind. It was fine though. I told him that if he wanted to buy it he needed to stand in the queue, wait and talk to the sales assistant and explain what he wanted. He did. Fair to say we had a very wet walk home. We just about missed the massive downpour at 12 but had got caught in the quite heavy showers that preceded that. Jenson and Wren didn't care though. In fact, Jenson was so worried about sheltering Wren from the rain that he didn't even seem to notice that it was raining. He was so fascinated by the torrential downpour that when we got home he grabbed an umbrella and his wellies and threw himself back in it. I guess it felt exciting to be stood in the middle of it. The sound of the rain pounding on the window pains certainly made it feel very powerful. And then we got onto the baking, not before lighting the fire and turning on the Christmas music. I had set him a realistic fundraising target of £10. The financial value wasn't huge but the value of the lessons it taught him were. We talked about the children we were helping and why; about how some children aren't as fortunate as him and Wren; about the value of things; about what it means to help other people and about how it makes them and us feel; lots and lots of things. They had more fun licking out the bowl and eating as much sugar as possible, but I hoped the moral side went in on some level. After a few hours of our baking marathon it was fair to say we were all starting to loose interest. 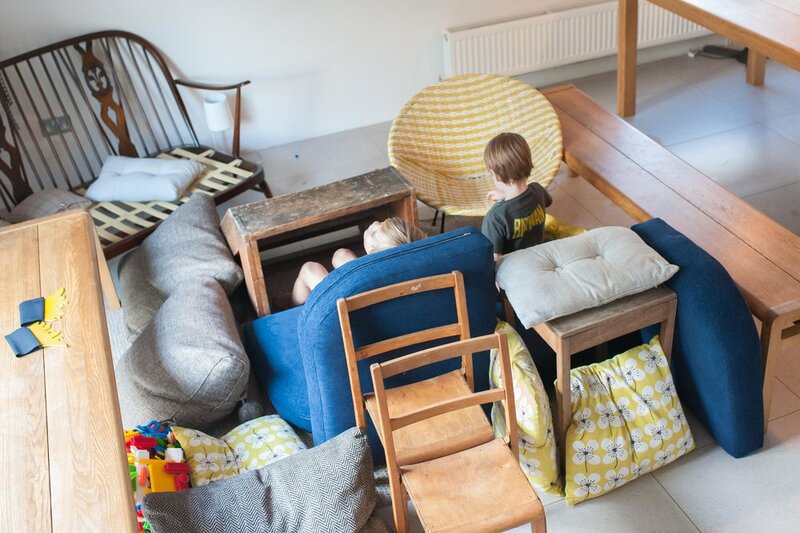 It obviously all fell on my shoulders, as the kids became far more interested in seeing how many pieces of furniture you need to build a boat den. All of it, evidently! See below. Their attention was quickly captured again with the promise of decorating biscuits with sweets. Obviously, this involved far more eating than decorating but there was some effort exerted on their part. The floor in my plan was that jam was needed to be applied to each smartie in order for it stick to the biscuit. The words kids and sticky jam just don't go together. Jenson's first attempt looked like someone had been mutilated over it so I changed tactics. They splurged the jam on and I stuck it to the biscuit. We finished the biscuits at around 3pm and had about an hour before we needed to go out to sell them. I had just enough time to print out a few labels so we could stick them on to our biscuit and money tins. Wren was not in a good mood by 4pm. She was tired and ratty and the thought of walking around the streets with a screaming 3 year old didn't appeal, so we drove. Anyone who knows us will know that we only live a few streets away from our old house, (which sits on a really friendly road full of kind and generous people) so driving was excessive but I had to offset something. Either drive, fundraise and enjoy or walk, fundraise and forget! First stop was Gail Scott's house. Her son Robyn is good friends with Jenson, they used to go to school together and we knew we could count on them to kick off our fundraising efforts! They gave us £2 in return for 3 biscuits and we were well excited, except for Wren, who I had left in the car, screaming. We hit Gratton Street, our old and very friendly road. First stop was Angus' house, we got a couple more quid off them before we moved onto a few new neighbours who had obviously moved in after we had moved out. Jenson was much more shy asking for donations from these people, but with encouragement from me and Wren stepping up shouting, "we made biscuits" when he was lost for words, we did it together! We called in at the vets and the chiropractor too. Everyone was very generous. Our aim was £10 but we made a staggering £23.13. My Dad arrived that evening and kindly topped the total up to £25. We will go to the bank on Monday after Lego club and pay it in. A great fundraising effort. Well done Jenson and Wren. Mummy and Daddy are very proud of you.